Stored some clothes in two boxes. Grabbed a bag. How many meth addicts does it take to screw in a light bulb? Answer: One and an eighth. This pathetic joke was meant to serve as an introduction to San Pedro, a little town that’s renowned for being very arranging with narco-tourists. 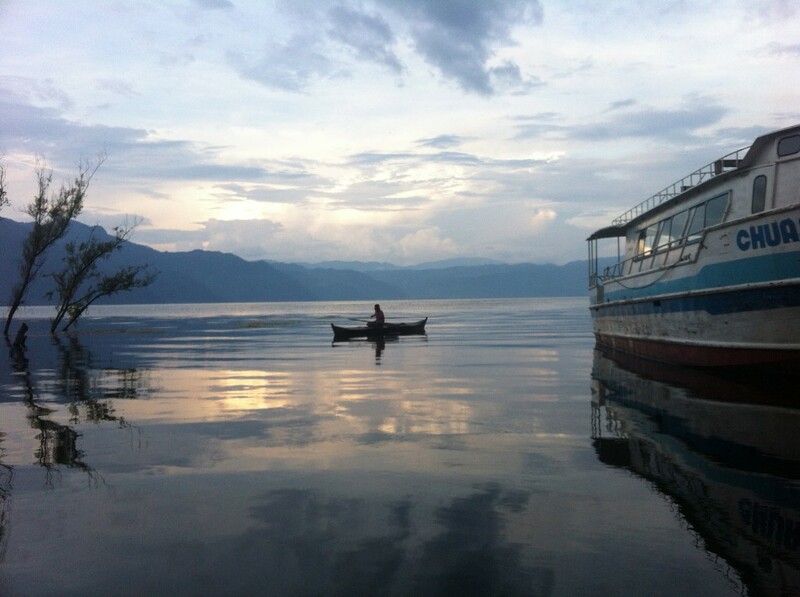 But anyway, that’s the first stop of my tour in lake Atitlan, Guatemala. Even though the lake is surrounded by beautiful little villages, San Pedro looks like an iguana dipped in vomit. Its building are a chaotic patchwork of unfinished concrete blocks, the colors of the walls are hideous and full of dishonest commercial signs for cheap hotels. You can tell nobody cares how this place looks. All that could have been improved by the town’s local authorities, but given the kind of population it attracts, why bother? There, you cross people that are so high you’re wondering if they can tell the difference wether they’re in the basement or suspended by the feet. Folks team-puking in the bus that takes them back home, broke gringos or old europeans seeking refuge in the anonymity of this crowded and exotic place. What’s the point of improving this village since nobody cares? Nothing needs to change as long as everybody has what they came for. San Pedro’s an interesting example of how crappy places become when they’re dedicated to drugs and nothing else. The vibe is weird and unwelcoming too. It’s like a coat of gunk that slides down the walls and sticks to your shoes. Also, you feel like a glass wall separating the locals from the tourists. They KNOW what brought you there. In many cases, they’re right. This being said, I’m having some fun in San Pedro. Firstly because I don’t care about sight-seeing, so the bad looks of the city with its crumbling infrastructure is no problem for me. Secondly because even if the village looks evil, the lake is gorgeous. And even if I didn’t manage to like all that, I can always find a way out of boredom by hopping in a tuc tuc. 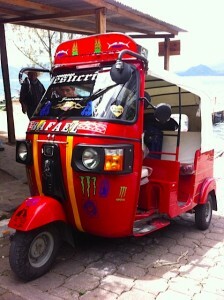 Tuc tuc: they’re gorgeous, aren’t they? Less than 50cts, that’s what a tuc tuc ride costs. And given how steep San Pedro’s streets are, you feel like in a roller-coaster. I took this video while enjoying a ride, put it here for you to enjoy it vicariously. Is that all about San Pedro? 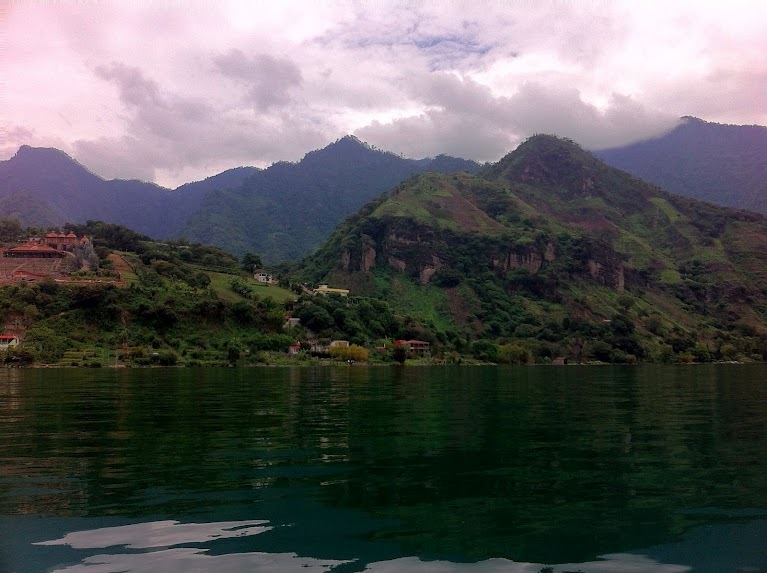 Really, that’s all there is, but I’ll tell you about a very different place surrounding Lake Atitlan in my next post.